The first team to play at the club were Brimsdown Rovers who moved there in 1956 when it was just a basic playing field. The clubhouse was built a couple of years later and in 1993 the adjacent sports ground of the chemical company Johnson Matthey was acquired to expand the site and cater for the ever-growing number of junior teams at the clubs. 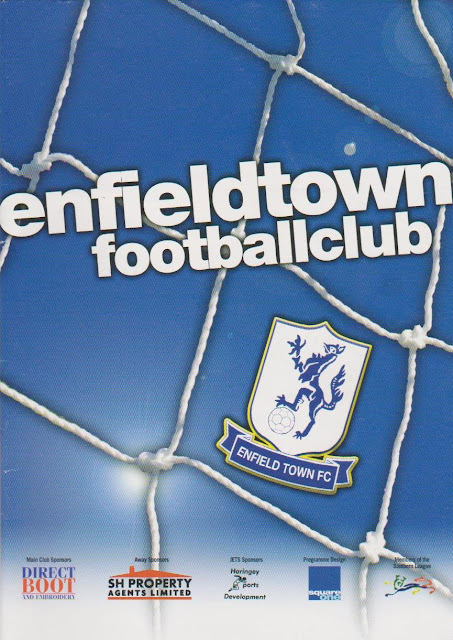 It was the formation of Enfield Town in 2001 that saw the ground be bought up to senior standard by adding covered seating for 150 and standing cover for 300 as well as the required turnstiles and other infrastructure for the setup. With the impending move of Enfield Town to their newly refurbished Queen Elizabeth II Stadium in 2011, Brimsdown Rovers took the decision to merge with Enfield 1893 (themselves set up by officials of the original Enfield FC after they predictably went bust) in April 2010. Enfield Town took many of the stands with them to their new home, dropping the ground back down to step 5 standard. They played here from 2010 until 2014, prior to their move to Harlow Town's Barrows Farm ground. The newly formed Brimsdown FC played here for the 2014-15 season, having been formed a year earlier, but they soon left to share at Enfield Town's current home. Finally, the ground was used in the 2015/16 season by Woodford Town FC, only themselves formed in 2007 as Goffs Oak and later merging with Bush Hill Rangers in 2012. They moved out at the end of that season and since then, the ground, to my knowledge, is no longer used for senior football. 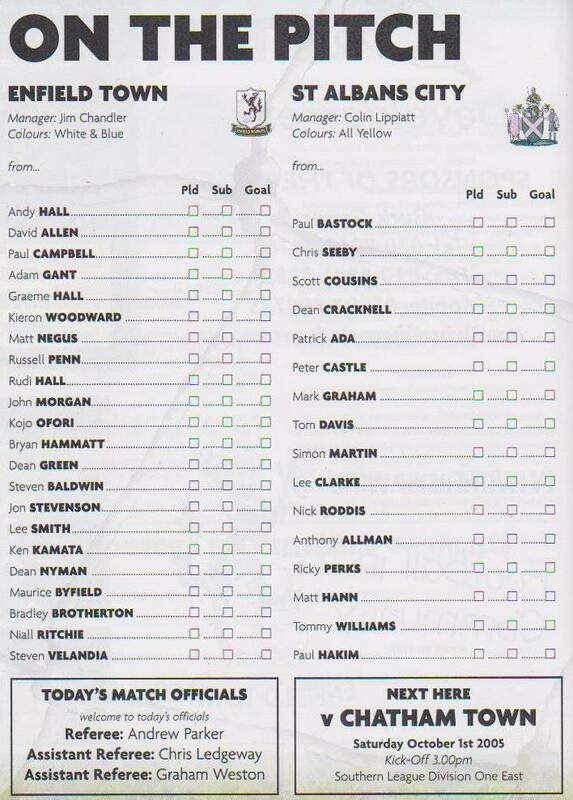 My only visit to Goldsdown Road came in the 2005-06 season when I was striving to complete a game in every round of the FA Cup. I was on my 4th leg of this journey, in the 2nd Qualifying Round. As I was also watching Wycombe home and away at that time too, it had to be when they were not playing and that was how I ended up spending my Friday night trundling round the M25. For a change, it was a journey without massive delays and so I got to Brimsdown at around 6.15. After going to a local shop to get some snacks for the game, I made my way up to the ground. It wasn't a bad game all in all, though I regret chucking out my programme in the interim period, as I've been unable to find a replacement since. 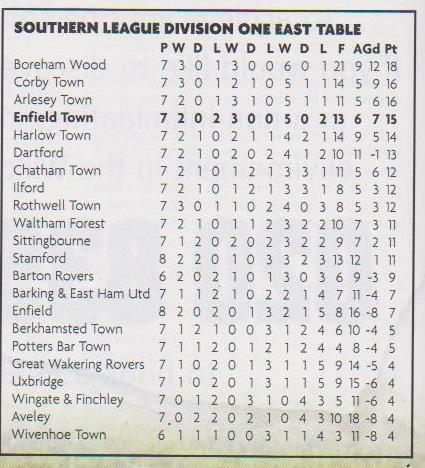 Enfield Town had only been formed 4 years previously in protest to how the original Enfield FC was being run. They'd taken those 4 seasons to get out of the Essex Senior League, winning the league twice but only going up the second time after they were initially denied fue to ground grading issues. At the time of the game, they were in the step 4 Southern League Division 1 East, eventually finishing 3rd at the end of the season, but ultimately failing in the end of season playoffs. St Albans City were playing two levels higher in the Conference South. They'd go on to finish as runners-up at the end of the season, so it was a game between two really in form sides. A decent home crowd saw Enfield Town make a bright start, but it was St Albans that came closest to scoring. It was quite a feisty game with plenty of wild challenges flying in. The hosts' David Allen was sent off for a reckless challenge just before halftime. Despite plenty of chances, it wasn't until 88 minutes that St Albans took the lead, Simon Martin finishing well past Enfield Town keeper Andy Hall after a good through ball. It was harsh on Enfield Town, but they were not beaten. 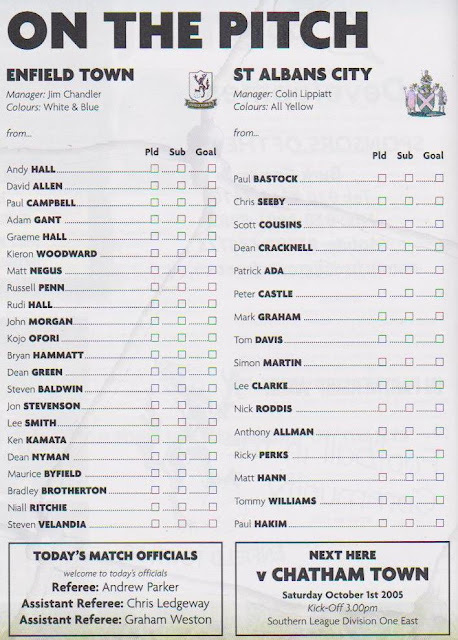 Within a minute, the scores were level, Paul Campbell's good run and shot was initially saved by Paul Bastock but Kojo Ofori was on hand to score. The game went to a replay the following Tuesday, with St Albans winning 3-0 on their own ground, thanks to having home advantage. FOOTNOTE: A few weeks after originally revamping this blog, I finally picked up the programme on eBay after a 7-year search which involved notifications every time a match came up on eBay and many fruitless searches through various club shops. Though no senior team plays at the ground, I hope to get back to take better quality pictures someday, albeit with the ground in a more basic state. The programmme was a good effort, with a few decent things to read - some of which are now included above. 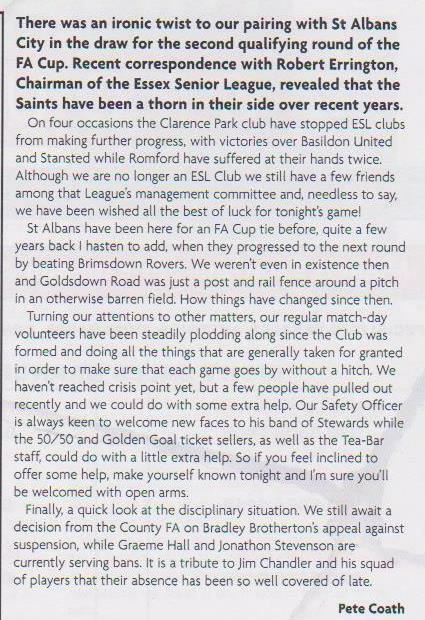 GOLDSDOWN ROAD was actually the home of Brimsdown Rovers FC, Enfield Town lodged there during their formative years. It was a basic pitch with a few temporary type stands to comply with ground grading regulations. There is also a bar at the ground, which is just as well, as far as I can remember, there is not much near the ground in terms of pubs or eateries. 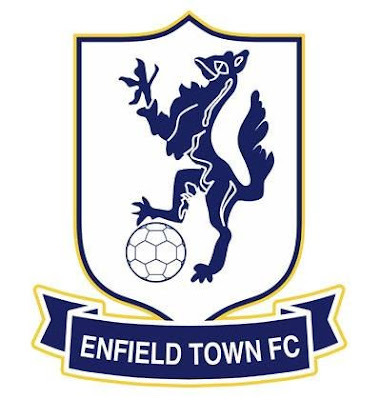 No senior team currently play there, though, in an ironic twist of fate, the original Brimsdown Rovers went bust, reformed and shared at Enfield Town's current home for a while.